At the beginning of the year, you will likely have parents requesting some form of year-end tax information regarding their account with your school. 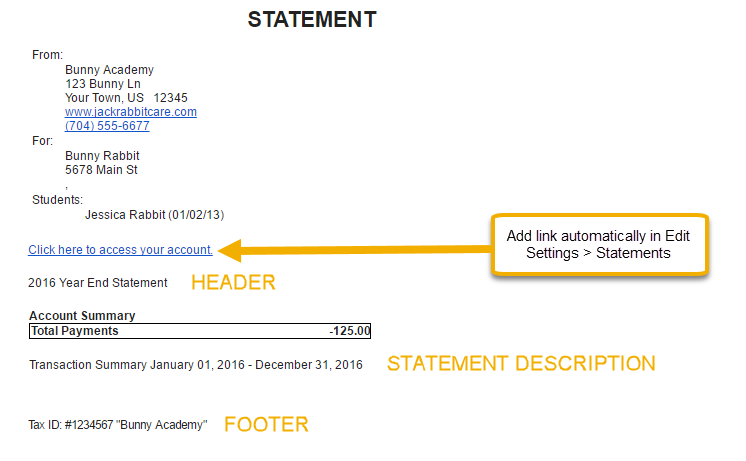 If you go to Reports > All Reports > Statements-Print or Statements-Email, you can use Jackrabbit’s Statement feature to produce a tax receipt for this request. Based on preference, you can print or email ALL families or specific families individually. Your database may have a saved FAVORITE for this already (20XX Year End Statement). Change the dates to reflect the year you need and run it to see what you think. Alternative options are described below. A parent requests tax documentation for all fees she has paid for the 2016 year. Select who is getting the statement - Family/Account Search Criteria. Change all fields to blank if sending statements for all active and inactive families with transactions in the past calendar year. Use Select Single Family Account if sending to just one requesting family. Select which transactions to include - Transaction Search. Note: This does not consider non-exempt fees and will only list payments received in the calendar year chosen, even if they were applied to charges in a different calendar year. Example: this can occur when an account has an overpayment or credit that gets applied to next year's fees. Show Statement Description – we suggest you set this to Yes. It will help further explain what is being included in this statement. 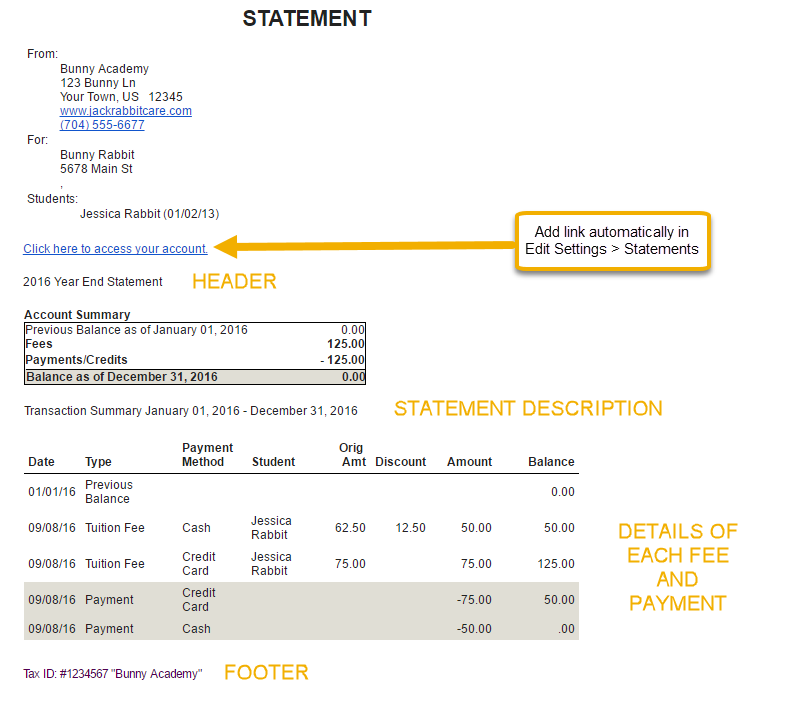 For the Statement Footer field, list your school’s Tax ID or EIN (Employee Identification Number). These statements includes payments made for ALL fees. If you have fees that are not allowable for taxes, please make sure your parents are aware! In the Statements section of Tools > Edit Settings, set Include Link to Parent Portal to Yes to give parents another quick way to log in to their account. This is another area where you can customize your Statement Header, Statement Footer, and other viewing options. Once you have selected the criteria for the tax receipts, click on Save Favorites to save as a template for next year! All you will have to do is load the favorite and change the year in the date range. If you choose to send the statements via email, the parent has access to that email message via their Parent Portal for 180 days, even if the parent did not receive the email to their email address. When the parent logs in to the portal, they will immediately see all recent communications (emails, registrations, texts, or public/private messages sent). Also, the parent can go to the My Account tab - there are buttons to view Online Registrations, Text Messages (if your school uses texting through Jackrabbit) and Emails. If a family requests a statement but you have sent them to the Lead File, simply find the family record in the Lead File and click on Restore Family. From there, you can follow the instructions above.